While Finland is well known for music, it's mainly rock and heavy metal bands that seem to come from Finland - over the last few years I've probably heard a few dozen bands of those genres from Finland, but this is the first time I've come across a Blues artist from Finland. I've been impressed by the standard of Finnish bands and musicians, and Erja Lyytinen certainly lives up to those high standards. This album is on CD and DVD and was recorded at the 100 club in London in October 2014. The songs here include a mixture of her own original songs and songs from Elmore James. 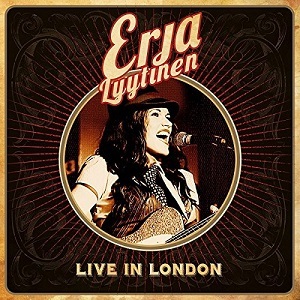 Erja Lyytinen plays guitar and sings and is backed by a rhythm guitarist, bassist and drummer. The show gives her plenty of time to showcase both her talents - she's got a lovely voice and for much of the time that is the focus of attention, but at other times - during instrumental sections or a guitar solo for example, she really gets to show off just how good she is on guitar. While her playing is excellent throughout the whole album, I particularly love the slide guitar work in "The sky is crying". After watching the DVD and listening to the CD a lot over the last week or so, I'm definitely planning to try and get to one of her live shows when she returns for a UK tour in October. It's an excellent album and one that makes me want to check out her studio albums too. It's a great release that I'd definitely recommend for Blues fans, and the fact you get a CD and DVD of the concert for the same price you'd normally pay for a CD makes it excellent value too.